When was the earliest account of a christmas tree? The custom of decorating an evergreen tree at Christmas can be historically traced back at least as far as 15th century Livonia and 16th century Northern Germany. It is widely disputed whether the first tree was set up in Tallin or Riga, but according to the first documented uses of a Christmas tree in Estonia, in 1441, 1442, and 1514, the Brotherhood of Blackheads erected and decorated a tree for the holidays in their brotherhood house in Reval (now Tallinn). At the last night of the celebrations leading up to the holidays, the tree was taken to the Town Hall Square where the members of the brotherhood danced around it. 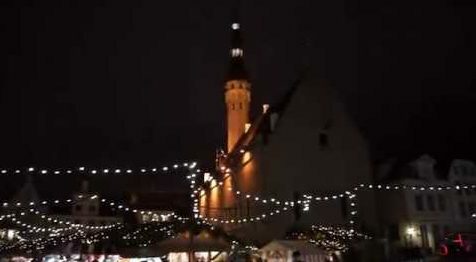 In 1584, the pastor and chronicler Balthasar Russow wrote of an established tradition of setting up a decorated spruce at the market square where the young men “went with a flock of maidens and women, first sang and danced there and then set the tree aflame”. In the German Middle Ages, mystery plays at Christmas time within churches often featured an evergreen “Paradise tree” from which an apple was plucked. The first evidence of Christmas trees outside of a church is of the 16th century, with trees in guild halls decorated with sweets to be enjoyed by the apprentices and children. (A Bremen guild chronicle of 1570 reports that a small tree decorated with “apples, nuts, dates, pretzels and paper flowers” was erected in the guild-house for the benefit of the guild members’ children, who collected the dainties on Christmas Day.) Soon after, they are seen in the houses of upper-class Protestant families as a counterpart to the Catholic Christmas cribs. In the 18th century they begin to be adorned with candles, which were expensive items. Only in the 19th century did they come into use more widely, often in schools and inns before they appeared in homes. A decisive factor in winning general popularity was the German army’s decision to place Christmas trees in its barracks and military hospitals during the 1870-1871 war. Only at the turn of the century did Christmas trees again appear inside churches, this time in a new brightly lit form. The Christmas tree is a decorated evergreen coniferous tree, real or artificial, traditionally associated with the celebration of Christmas. It is brought into the home and decorated with Christmas lights (originally candles), ornaments, garlands, tinsel, and candy canes during the days around Christmas. An angel or star may be placed at the top of the tree, representing the host of angels or the Star of Bethlehem from the Nativity.